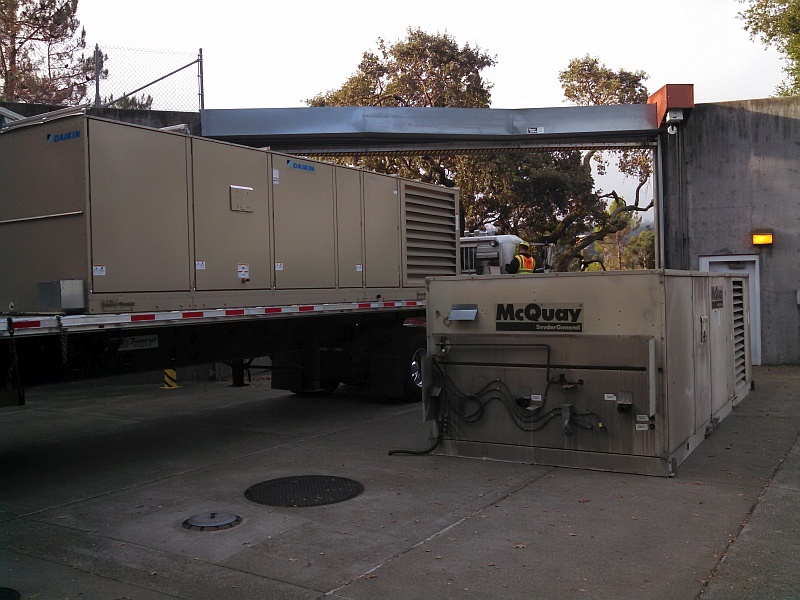 Air Handling Unit Replacement at Marin County Jail | 15000 Inc. This past Saturday I spent the day over-seeing the replacement of the air handling unit at Marin County Jail. This engineering project started months ago and quickly became a challenge when we learned that there was no currently manufactured unit that would fit on the existing structural frame. The roof area was extremely limited and there was no other place to put the unit. After much research and many dead ends we finally contacted Norman S. Wright for assistance. Matt Justus thought that Daikin might be able to help. Out with the old McQuay unit and in with the new Daikin unit. The biggest challenge was that the unit would have to be custom-built to fit a very specific set of dimensions. After some review, Matt got back to me and explained that Daikin could build this 25,000 CFM air handler to the required dimensions. The unit is a variable air volume 60 ton dx/gas split system serving many of the secure areas of the facility. The air handler portion sits on an existing 36″ high structural frame. The adjacent condenser was re-set on the existing concrete sleepers. Trahan Mechanical won the Marin Department of Public Works public bid for the job. After shop drawing review, the unit was ordered and the construction planning began. The challenging part of construction was an owner directed schedule that required the contractor to have the entire change-out completed over a three day weekend. This required an extensive planning effort to make sure all components were on site and all contractors were properly staffed for the three day marathon. Any delays would create serious challenges for the Marin Sheriff’s Department who staff the jail. The effort started on Friday and the new unit needed to be operational by Monday morning. It was a well choreographed effort lead by Tim Trahan, one of the owner’s of Trahan Mechanical. 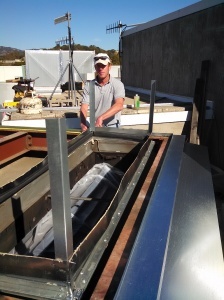 In fact, I watched with some amazement as Tim measured, cut and installed the supports for the condensing unit. Tim was hands-on all day while, at the same time, driving his crew and subs for the various portions of the installation – refrigerant piping, power wiring, controls, flashing, duct connections and a myriad of other tasks. Tim Trahan – a boss who actually works! He did an amazing job choreographing the change-out. The massive 200 ton hydraulic crane, provided by Precision Cranes, was scheduled to be on site for one day only. The crane arrived and was set up by 8 am. Tim had the old unit off the roof and the new unit set on the existing curb by 11:30 am. While there were a few hiccups as the day progressed, Tim was able to get the fans running and air supplied to the building by the end of the day on Saturday! A truly remarkable feat. By Tuesday morning the system had been commissioned by a Daikin factory technician. 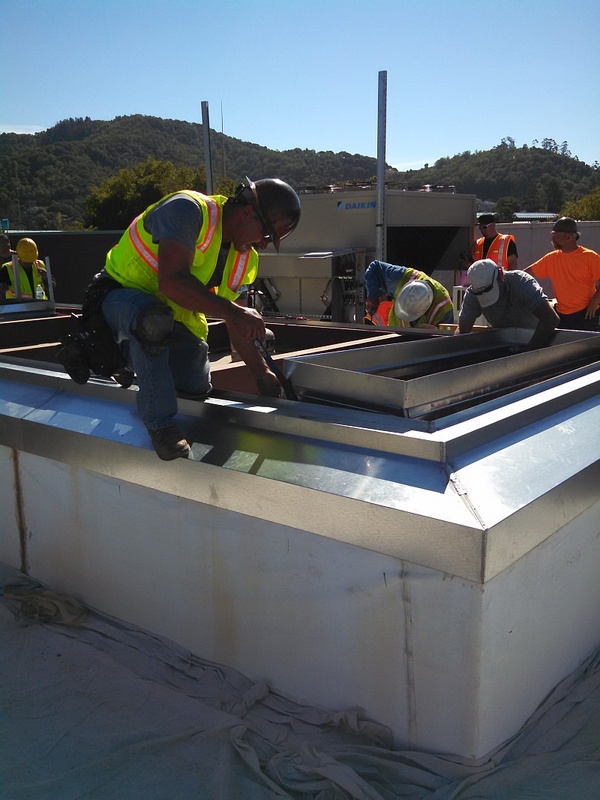 15000 Inc. was proud to have been apart of this challenging project for the Marin Department of Public works. Working with their seasoned project manager, Cam Isaza, made it a rewarding experience. Thanks Cam! No inmates were hurt in the making of this video. 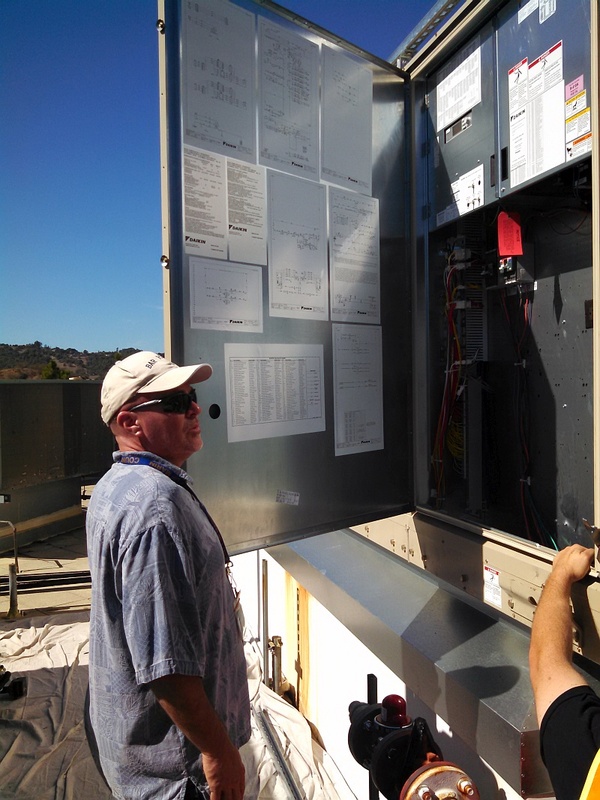 Cam Isaza of Marin Department of Public Works inspects the new unit. Gary Welch is a principal of 15000 Inc. with over 40 years experience in the field of HVAC, plumbing and controls system design. He can be reached at gary@15000inc.com.